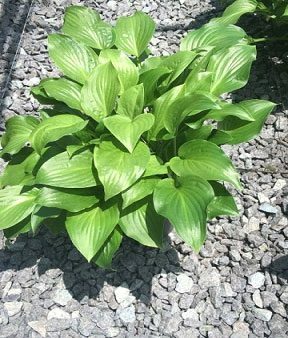 Although all hostas are beautiful and relatively easy to grow, the Royal Standard hosta is unique for several reasons. For starters, it was the very first plant of its kind to receive a plant patent. The patent was a way of recognizing the work that led to its cultivation and was a way to distinguish it as a totally new variety of hosta. Practically speaking, gardeners love Royal Standard because of the unique design and texture of its green leaves. Each leaf has a wavy appearance that adds interest wherever you plant it. This variety of hosta is larger than some others we sell, so consider it if you have open areas you’d like to fill in. Most people don’t think of the hosta as a fragrant plant, but Royal Standard is the exception. Its white blooms are not only beautiful but will add a wonderful scent to your home. An added bonus: It’s very tolerant of the sun and will be a standout in your garden all summer long.